See a Horseshoe Crab? Help It Out! Next time it’s low tide on the nearest sandy beach or shore, take a careful look down: you might see part of a horseshoe crab poking up out of the ground. Spring is peak mating season for horseshoe crabs, and biologists with the Florida Fish and Wildlife Conservation Commission (FWC) are asking encouraging everyone (including you!) to let them know when you spot one using the new FWC Reporter application. Horseshoe crabs mate year-round, and it is most common to see groups along the shore in March and April. To identify mating pairs, look for a smaller male on top of a larger female. Beachgoers will likely have the best luck spotting horseshoe crabs within three days of a full or new moon. The next new moon is Saturday, March 17. According to the FWC site, horseshoe crabs are one of the oldest animals on the planet and can be traced back to 445 million years ago–that’s 200 million years before dinosaurs existed! Interestingly, horseshoe crabs aren’t crabs at all. They’re actually closer to arachnids, a group that also includes spider and scorpions. Their shell, although hard, is very sensitive to stimuli. And with 10 eyes, these “living fossils” are very sensitive to light. 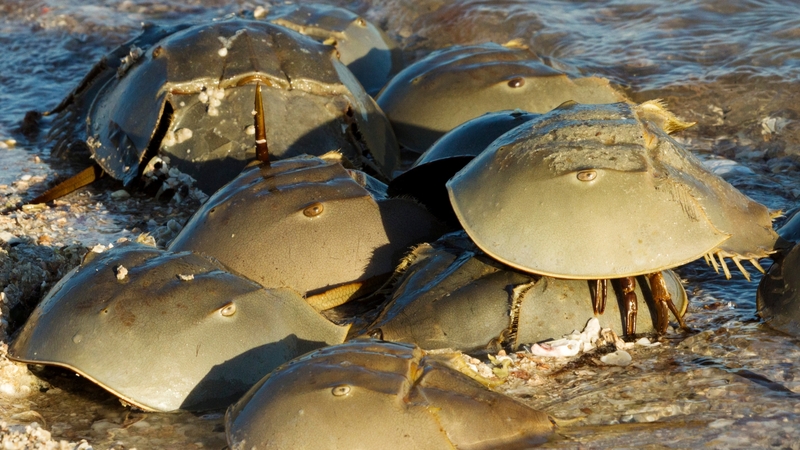 Although they aren’t endangered, the number of horseshoe crabs is declining due to overfishing and loss of habitat. But you can help conservation efforts by reporting sightings of the horseshoe crab on the FWC app. These sighting reports provide important information about population distribution to the FWC. If you see a horseshoe crab on its back, gently pick it up (holding both sides of the shell, never the tail) and release it back into the water. Simple actions like this help conserve this species and the many other species that depend on it. To report sightings, you can visit MyFWC.com/Contact and go to “Horseshoe Crab Nesting Activity” for the “Florida Horseshoe Crab Spawning Beach Survey” link. You can also download the FWC Reporter app on Apple or Android smartphones or tablets from the App Store and Google Play for free. You can also report findings via email at horseshoe@MyFWC.com or by phone at 866-252-9326.